Here's another 7A38 Franken that might well catch out the unwary punter. It was listed earlier today by an Australian eBay seller. It's similar in concept to one on the previous page, except this appears to be better executed. 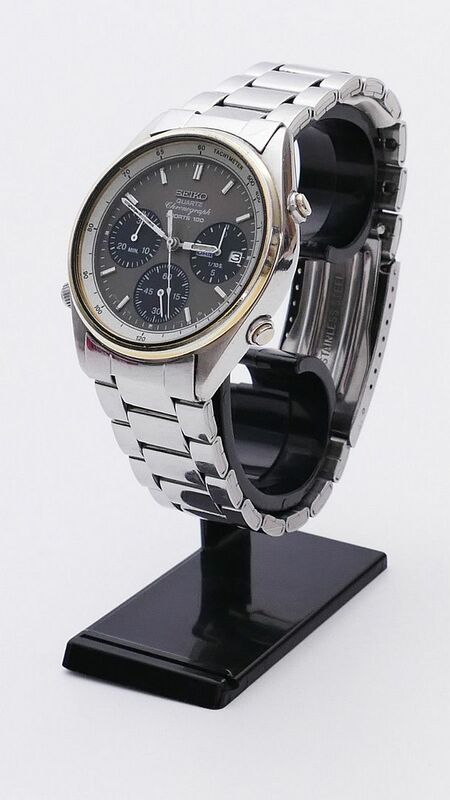 The case, bracelet and Tachymeter ring (and presumably case-back) are from a half decent stainless 7A38-7020 (as opposed to the usual favourite choice of over-polished two-tone 7A38-702x), which has been fitted with the 710L dial / movement from a black chrome 7A38-7180. 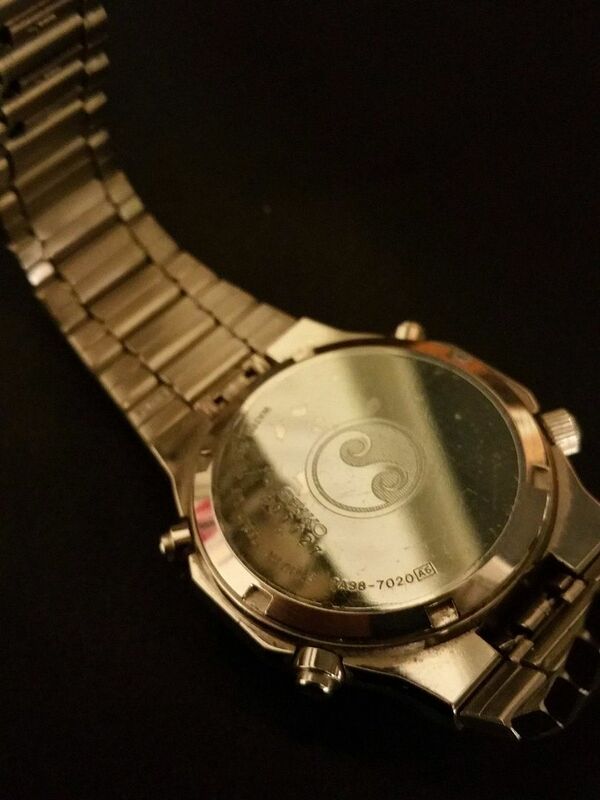 Looks like the fabricator has used the crown from that watch too. 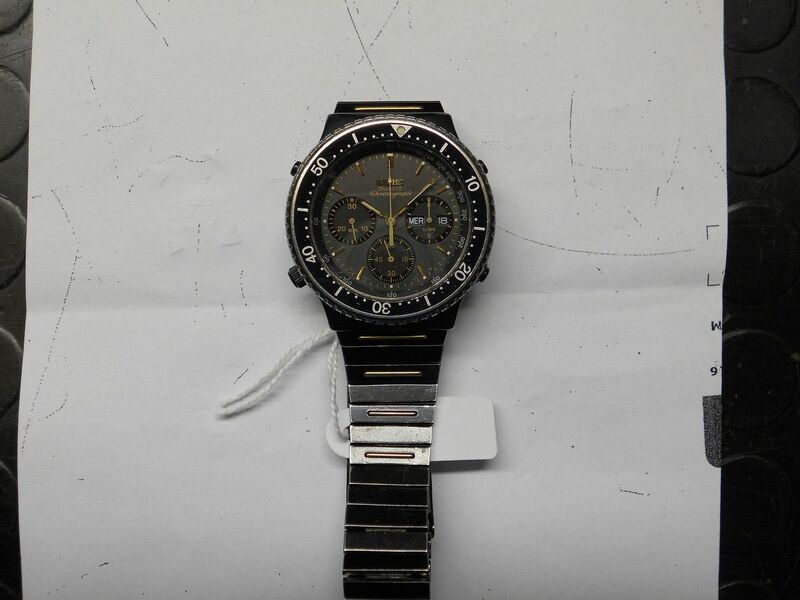 The bracelet appears to be the correct p/n B1171S (see seller's description). 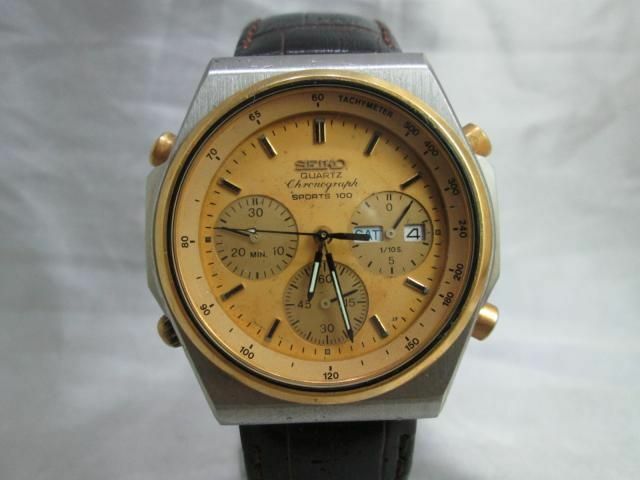 Seiko 7A38-7020 (gold hands and markers) in good condition for its age. 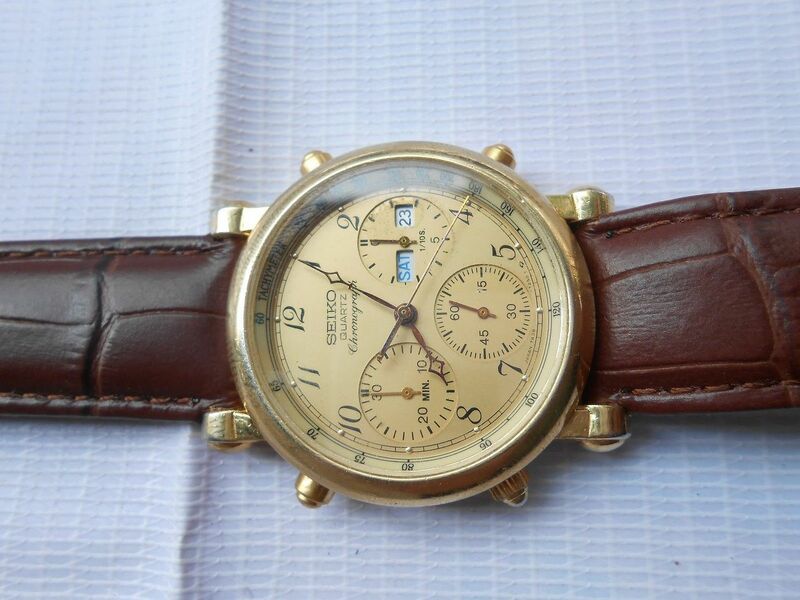 Has slight marks on the case, band and glass consummate with its age, but is in generally good cosmetic condition. Please see the photos and judge for yourself. 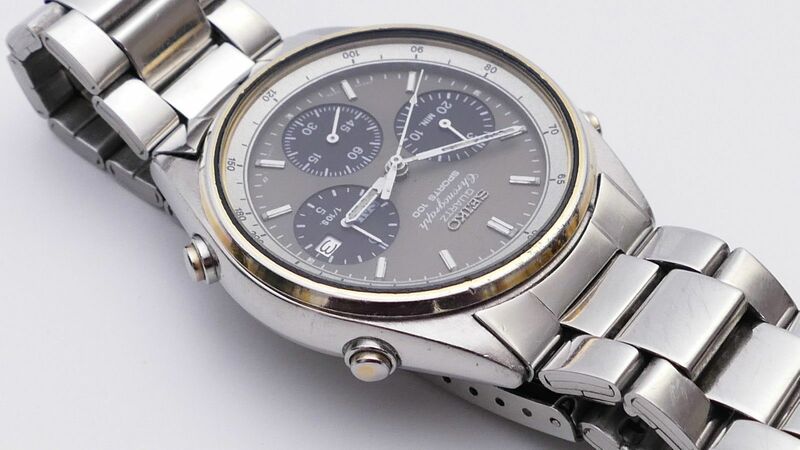 All functions start and stop as they should (day, date and chronograph) and the watch keeps good time. 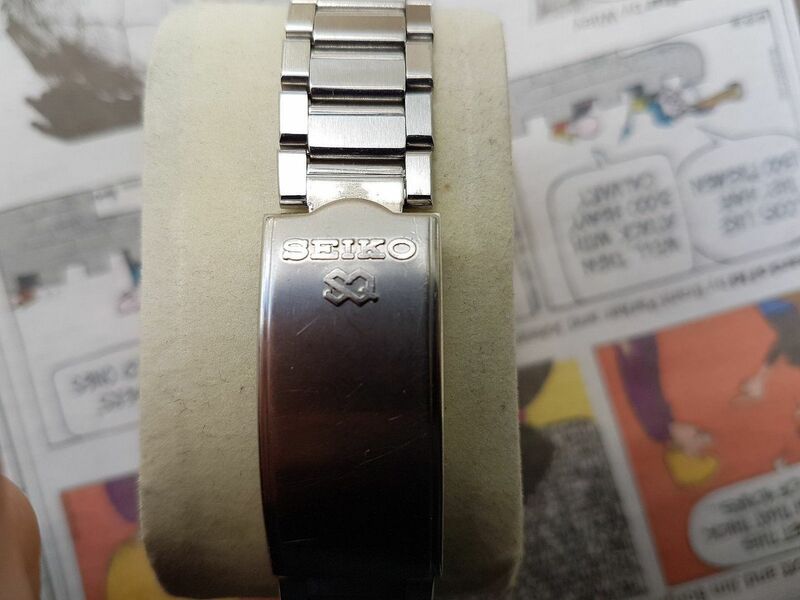 I am uncertain if this is the correct band for this watch, but the clasp is marked SEIKO SQ and the band is marked "all stainless steel japan" . 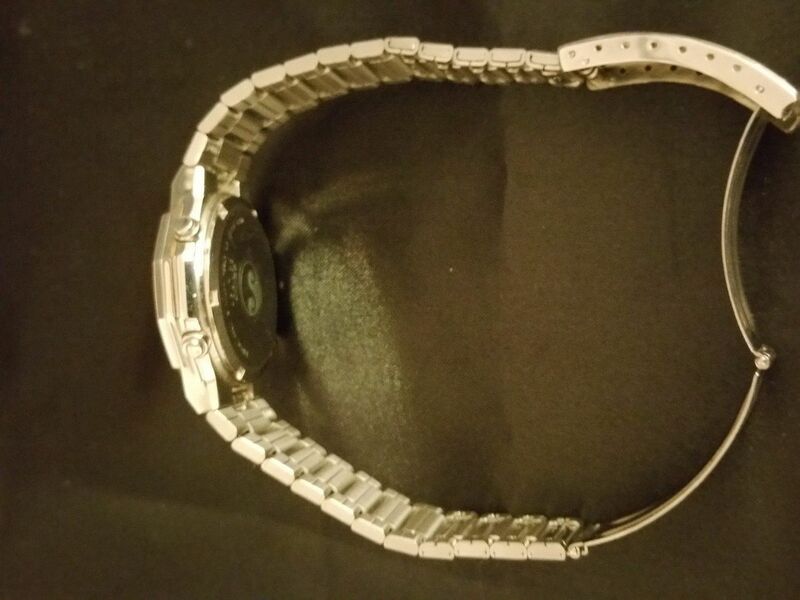 The band has plenty of removable links and should fit a 7 3/4" wrist. 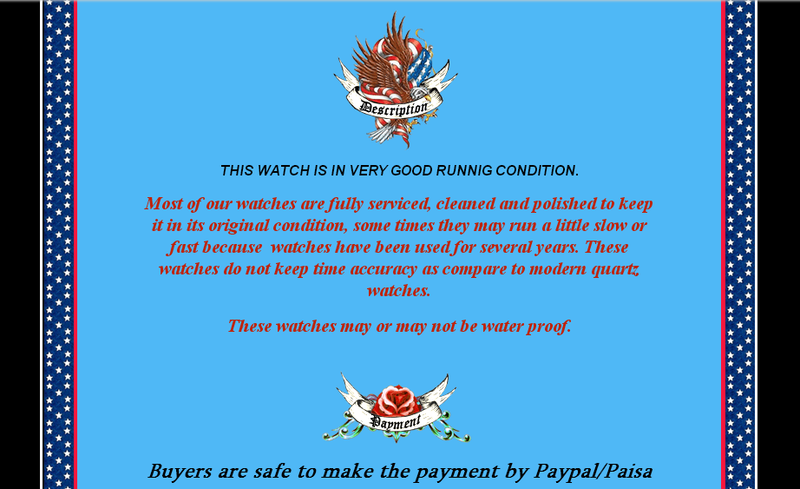 I cannot guarantee the watch is waterproof and would recommend it be serviced and tested before using it in water. Fell free to ask any questions. I will only send items by signed for post. Thanks for looking. Belated update - subsequently withdrawn by the Australian eBay seller the following day. It's back again - re-listed overnight. I'm in catch-up mode this weekend - seriously back-logged after a couple of very busy days at work, annoying problems with the forum (which still persist), then Photobucket was down for the last two days. I was already falling behind with posting before the hiatus. Anyway, without further ado (or excuses), here's the somewhat belated result for Wai Phyo's 7A28 / 7A38 Franken. The re-listed auction ended last weekend, selling for $91 after 21 bids. 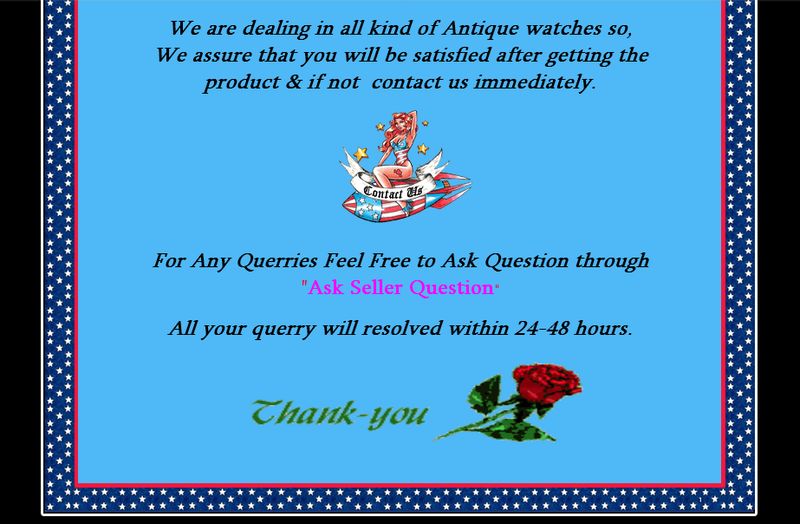 Here's a truly awful Franken, nailed together in the best Filipino watch-botcher tradition by an Indian eBay seller, for a change. It was listed a couple of hours ago. 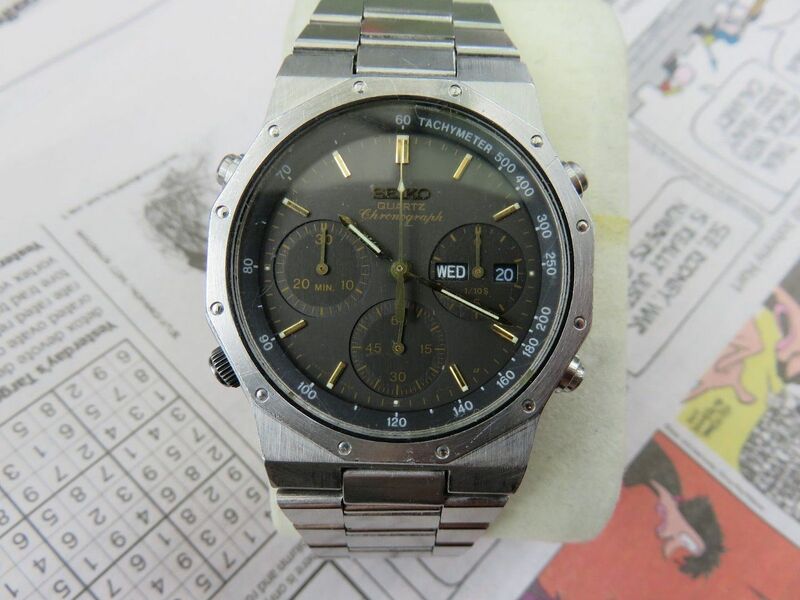 The watch is obviously based on a Yema N81W43 case and it retains that watch's Tachymeter ring. 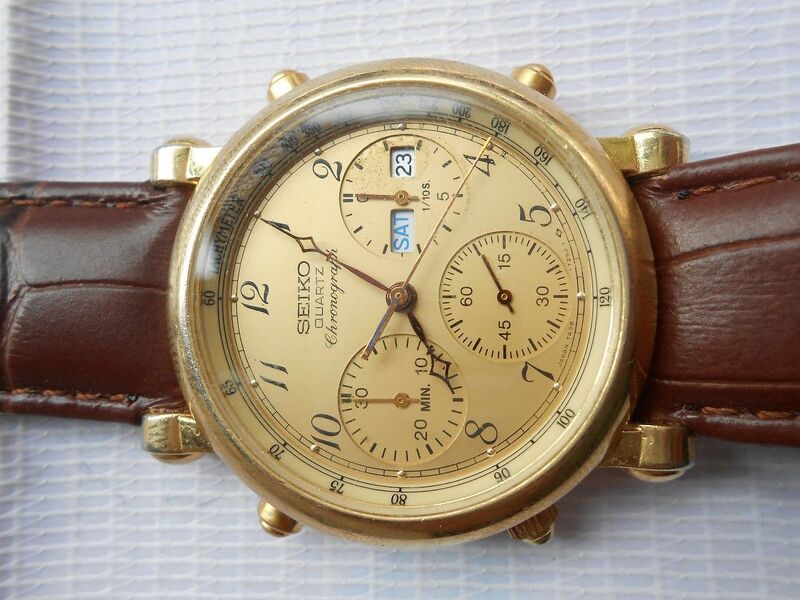 The gold arabic number dial is a 7250XG14 out of a common-or-garden gold-tone 7A38-7289. The hands all appear to be from the Yema N81W43, but have lost their original blueing. 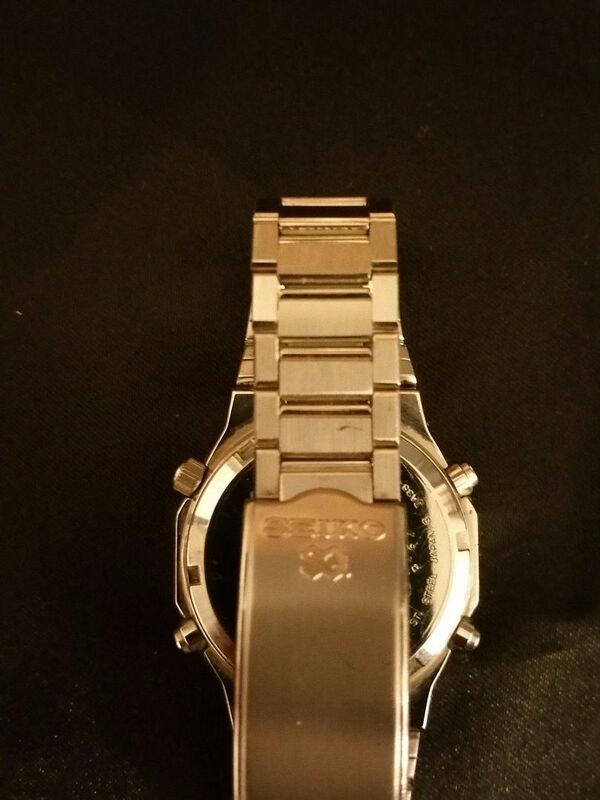 The case-back is off a stainless 7A38-7190. 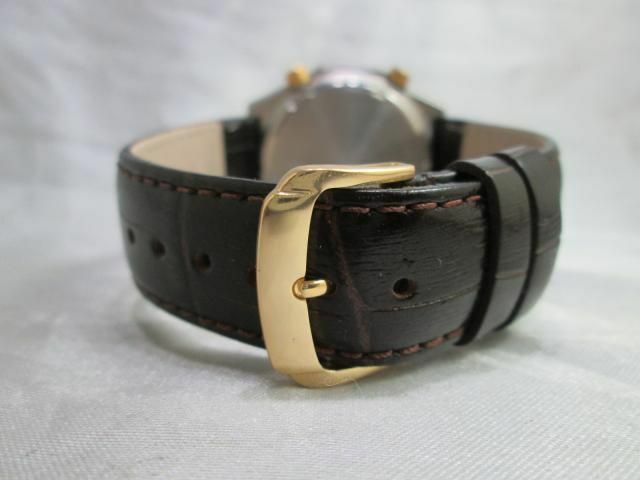 To top it off, it's fitted with a 20mm mock-croc strap that's been notched on one side and squeezed on the other to fit the watch case's 18mm lug width !! I've only bothered uploading 6 of the seller's 12 photos, because many are very similar. In fact, two of them are duplicates. The patriotic (to the US) techicolor description tells you very little and is clearly designed to appeal to our colonial cousins. 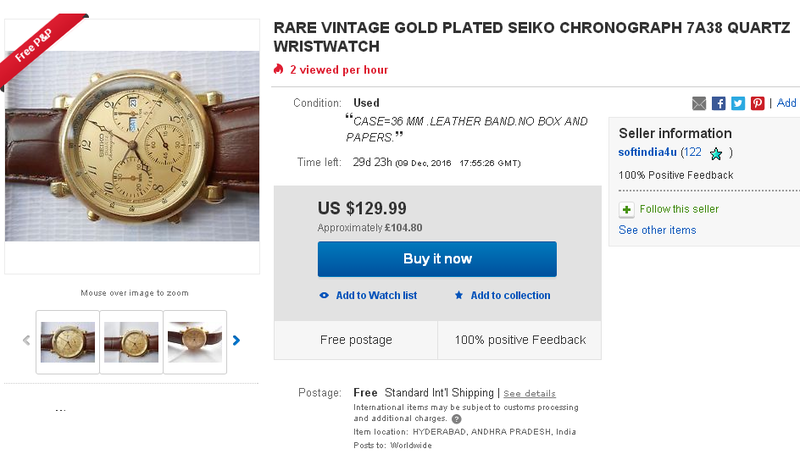 The above original eBay listing for that horrible Yema N8 / Seiko 7A38 Franken was ended early by the would-be Indian seller, a couple of days before the 30-day auction was scheduled to end - allegedly because the item was no longer available. However, it's been re-listed a couple of times since (it's not easy to miss) and the current re-listing has 7 days left to run. Thankfully, despite 333 views of the current re-listing to date, no-one has fallen for it yet. But then maybe it's just too obvious. 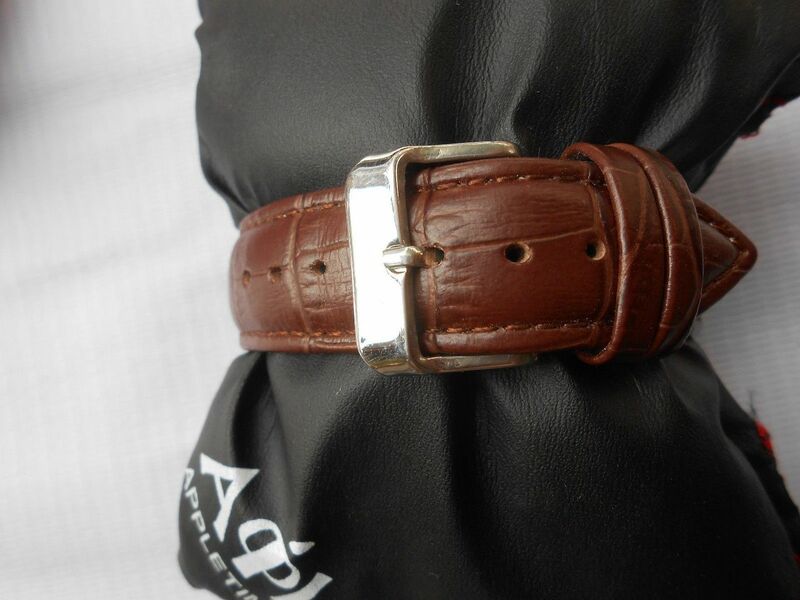 But then not all Frankens, particularly those using a familiar 7A38 case and bracelet are always quite so obvious. 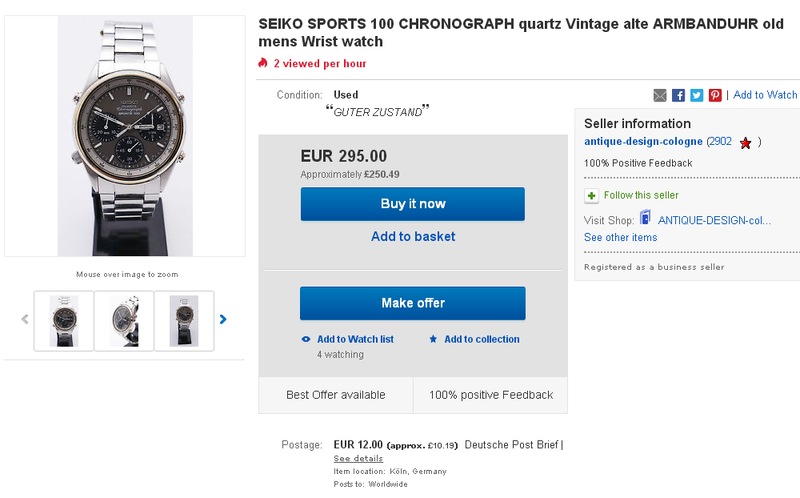 Were it not for the greed of the would-be German eBay seller, in asking 469 Euros (approx. £400) as a Buy-it-Now, for this next rather more subtle 7A38 Franken, I'm sure it would quickly catch out some unwary punter. Strangely, though he's only listed it for 3 days. 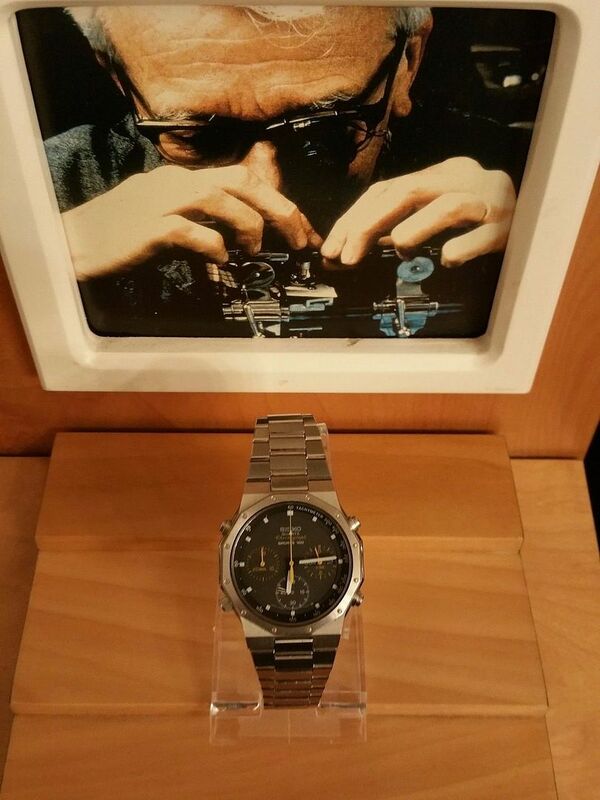 The watch case and bracelet (and presumably Tachymeter ring) are from the familiar and very popular stainless 7A38-7020. They appear to be in almost mint condition, apart from a slightly mis-aligned bezel. Note the protective film still present on the case-back. 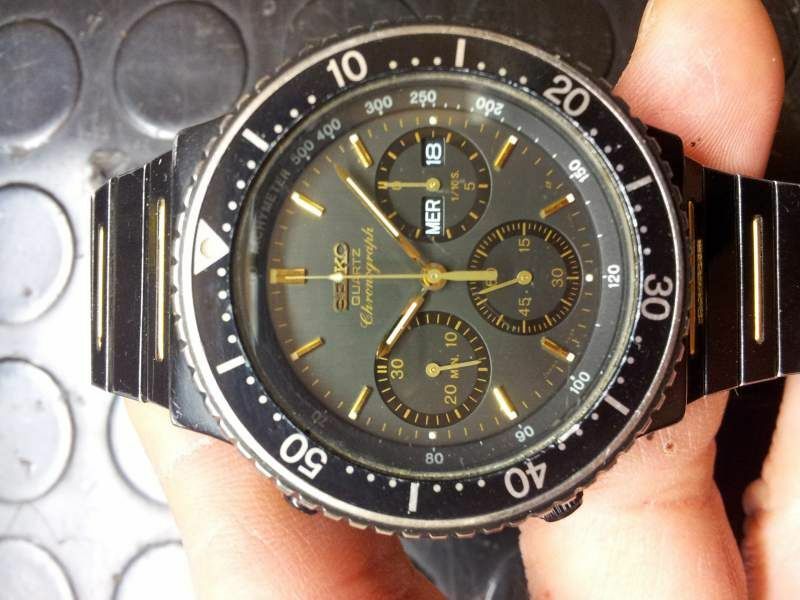 The dark grey dial and yellow / orange chrono' hands (and presumably the movement) are from a completely different model. 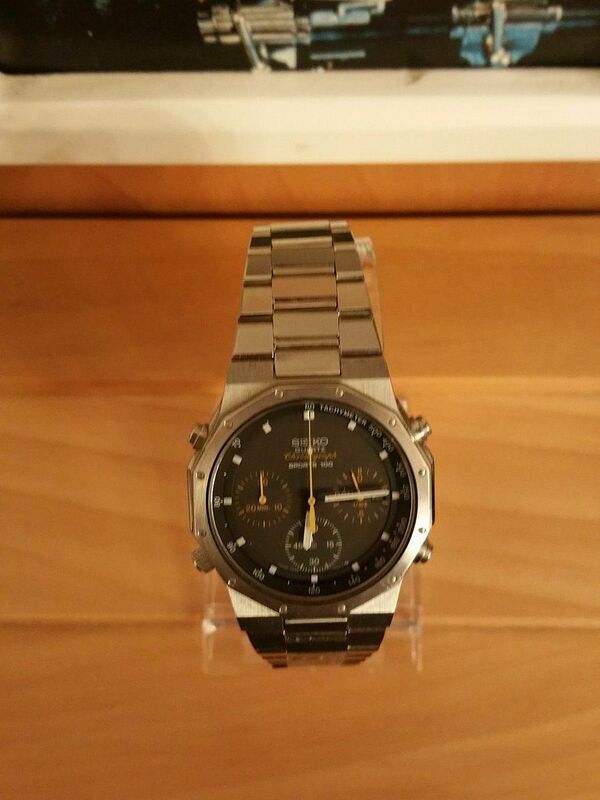 It's a 706L dial from the dark grey PVD / black chrome coated 7A38-704A / 704C (or possibly a -704B). The lumed hour markers of the 706L dial sit on an outer dial ring, which is part of the dial. 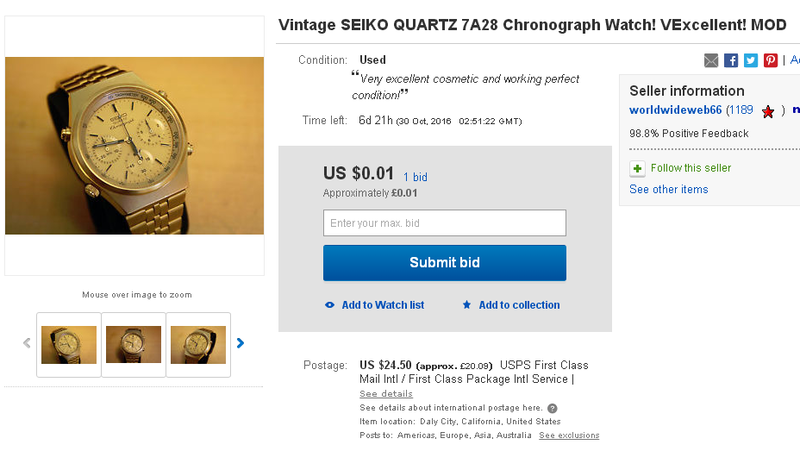 Note the apparent slight gap between them and the 7A38-7020's Tachymeter ring, visible in the seller's 4th and 5th photos, which is likely due to clearance issues. Looks like someone may already have been tempted by this Franken. I found a previous listing that had been ended earlier. 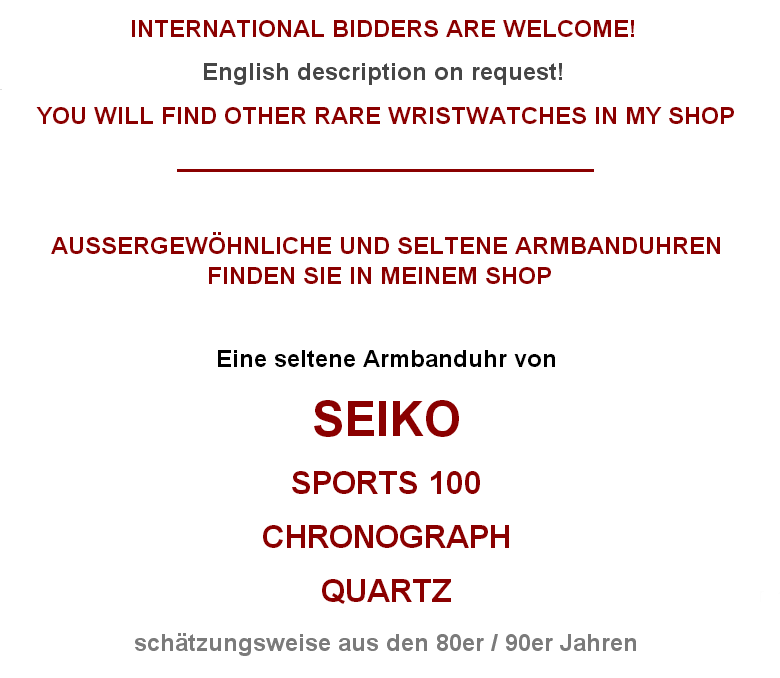 Or perhaps this devious German eBay seller also likes playing 'Now you see it; now you don't' mind games. You don't often see 7A38 Frankens on Yahoo Japan auctions, especially not one made up from 2 (comparatively rare and desirable) export models, so I thought I'd give this a quick mention. 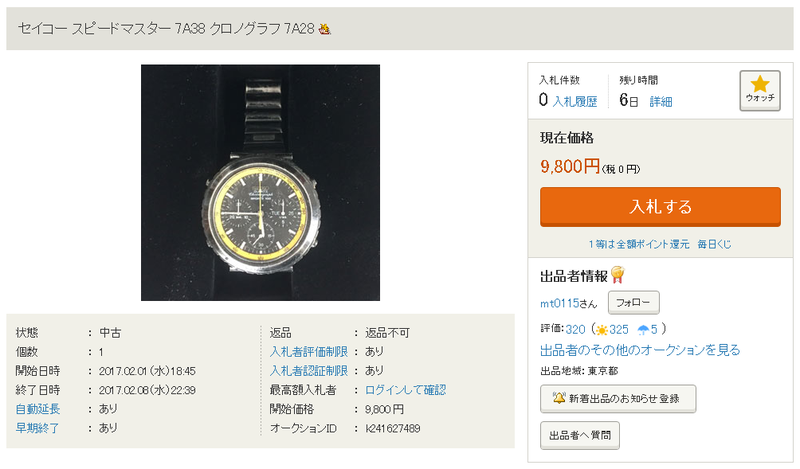 It was listed yesterday, as a 7-day auction with an opening bid price of 9,800 Yen. Both title and description are fairly vague and there's only one very small (300x300) uploaded image. 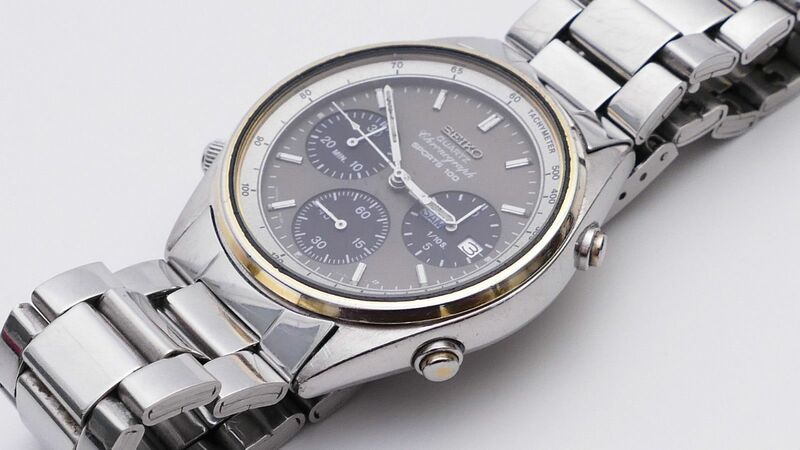 It is a quartz chronograph of Seiko. It is a dish of 7A 28, 38 series which boasts very core popularity. Also, such as parts taking is recommended. I hope in junk treatment. Please promise a no return. * We will refuse to bid for troubles avoidance. I will cancel the procedure. For those of us familiar with the original unmolested 7A38's, even from just that one small photo, it's not too difficult to figure out what it's made up of. 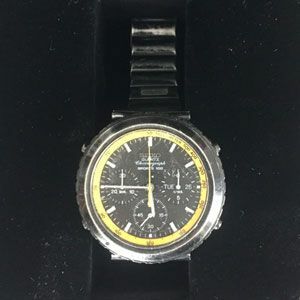 The well-worn black chrome coated case and bracelet (and yellow Tachymeter ring, which is the big giveaway) are from a 7A38-7140. 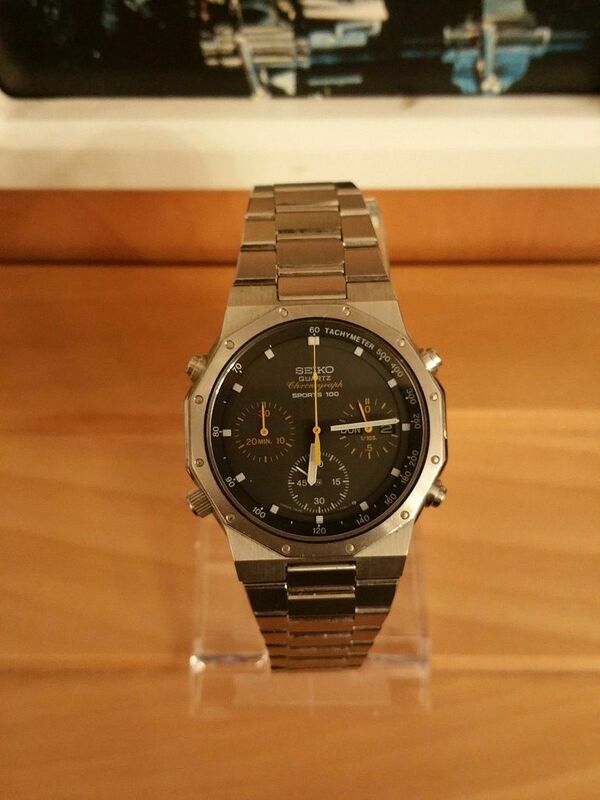 The all black 'Sports 100' 709L dial, hands (and presumably the movement) are from a similarly black chrome coated 7A38-7080 'Diver'. 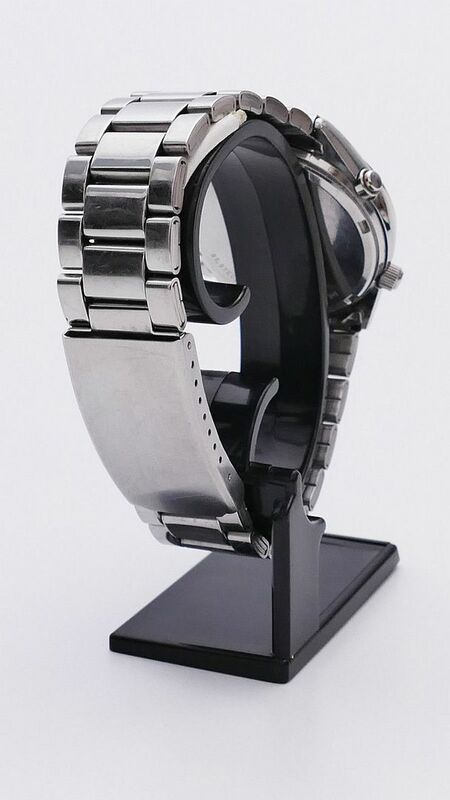 The donor watches probably looked something like these (images borrowed from recent eBay listings). 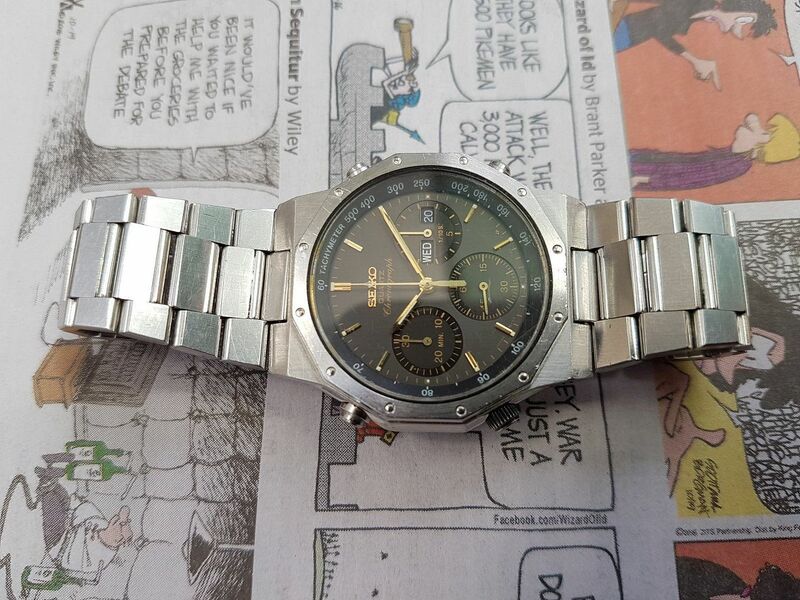 That most recent re-listing for the horrible Yema N8 / Seiko 7A38 Franken, by the would-be Indian eBay seller, ended a couple of days ago (as scheduled), with it still unsold. At the time of writing, it hasn't been re-listed. That wasn't the only offer he received by any means. Here's just a few of the earlier offers (against previous listings) he rejected. Whether the eventual buyer realizes what he's actually bought, only he knows. That there was this much interest in this particular Franken isn't a great surprise. 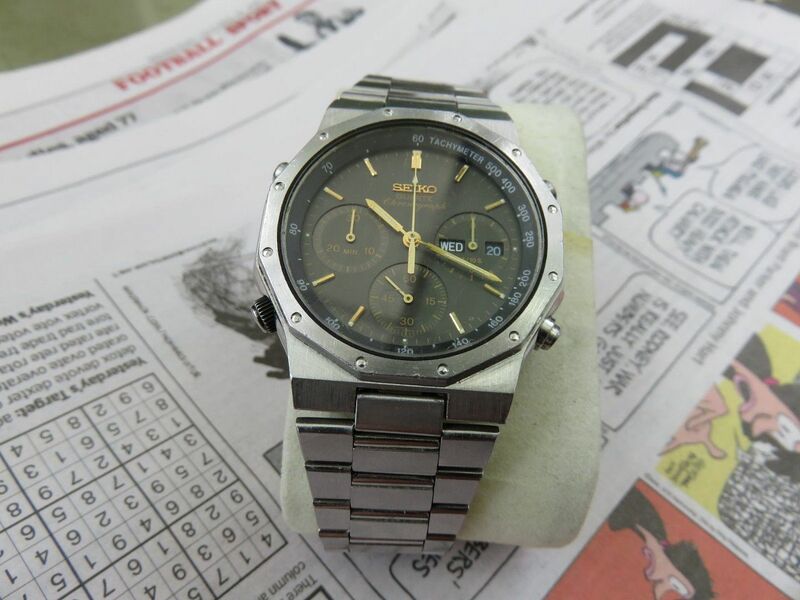 The stainless 7A38-7020 is a very popular model - WTB adverts are constantly popping up on other watch forums. 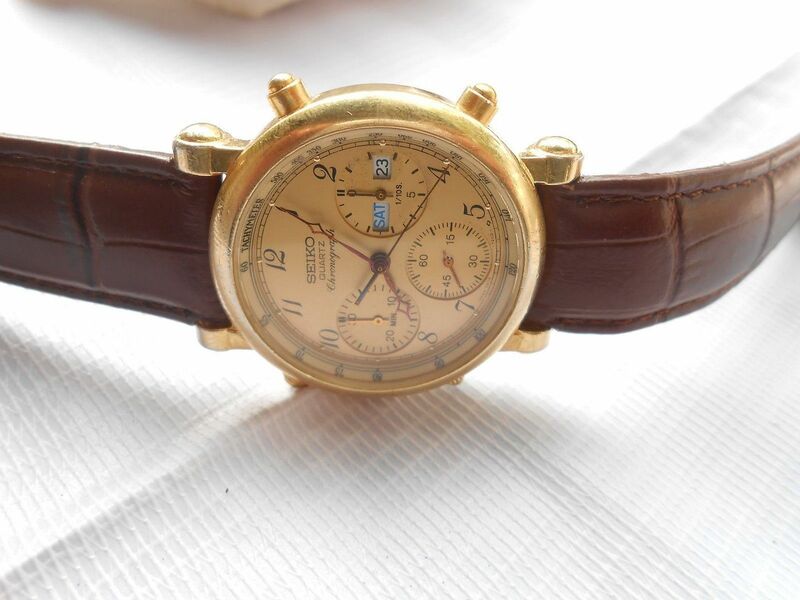 Even average examples like this, which sold on eBay on Monday for $533 are going for 'crazy' prices lately. 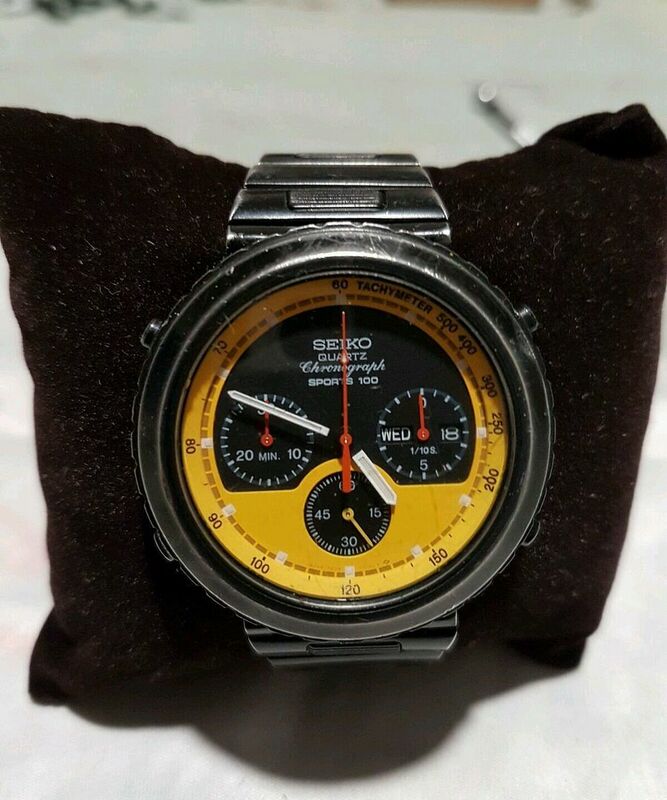 The thing about that Franken was that it was built on an almost mint (if not NOS) case and bracelet. 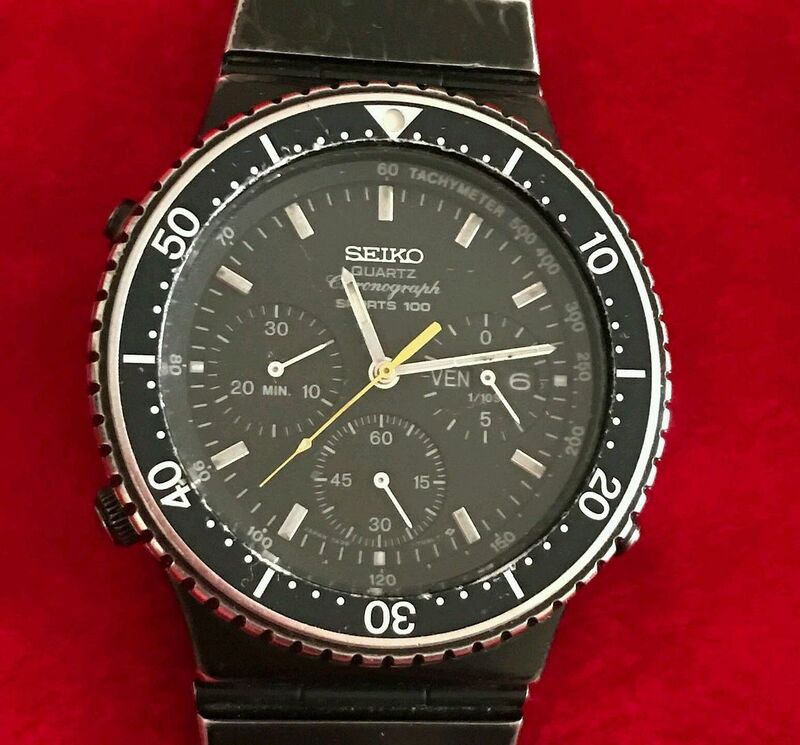 Who knows, perhaps the buyer knew exactly what he was purchasing and plans to fit the correct dial hands (and movement) and return it to its original Seiko configuration. 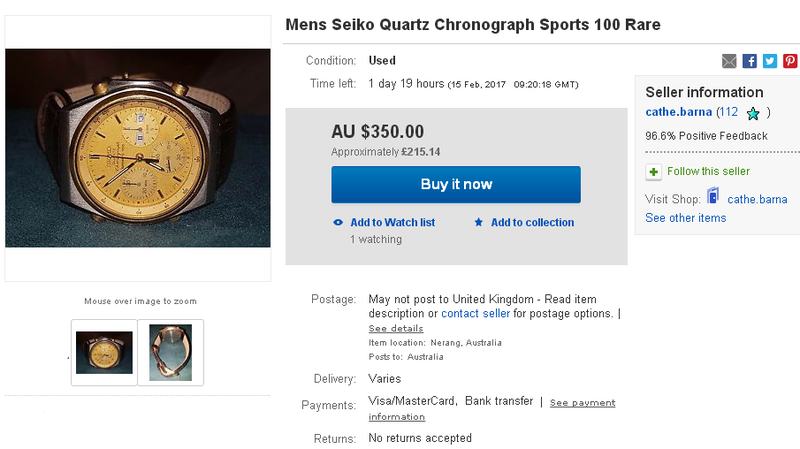 I was just idly browsing eBay (searching on 'Seiko Sports 100 Chronograph') when I spotted this truly horrible Franken listed by an Australian seller. There's no mention of '7A38', let alone any model number in the title or description, nor does the seller make any claims for originality - which is just as well, because if my analysis of it is correct, it's a real hotch-potch ! 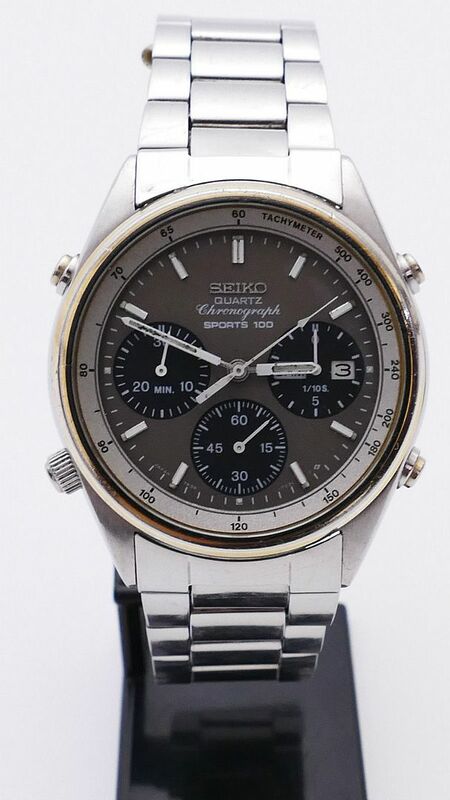 Mens Seiko quartz chronograph sports 100 rare vintage watch. 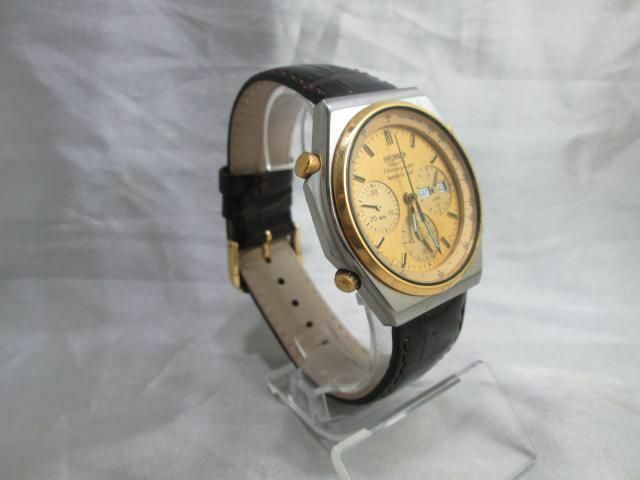 In overall great condition with very minor wear and patina from age. 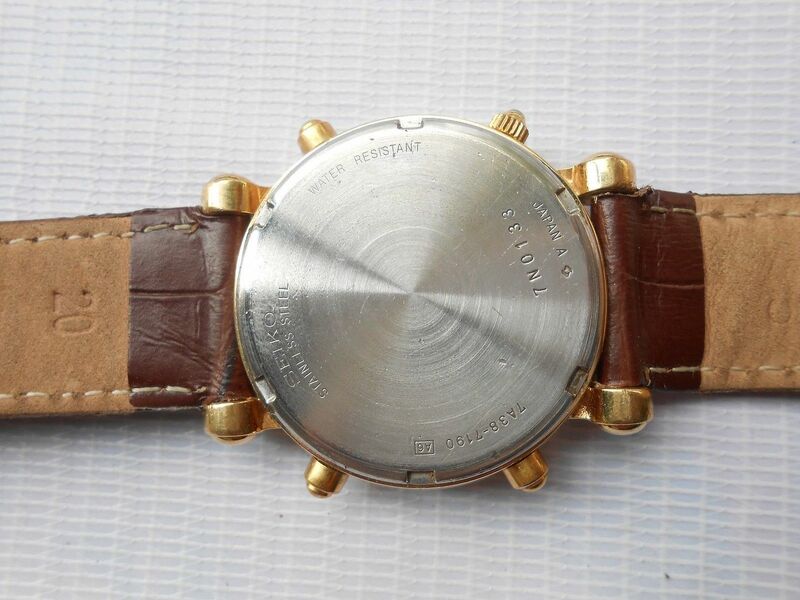 A really cool watch. Looks great on. 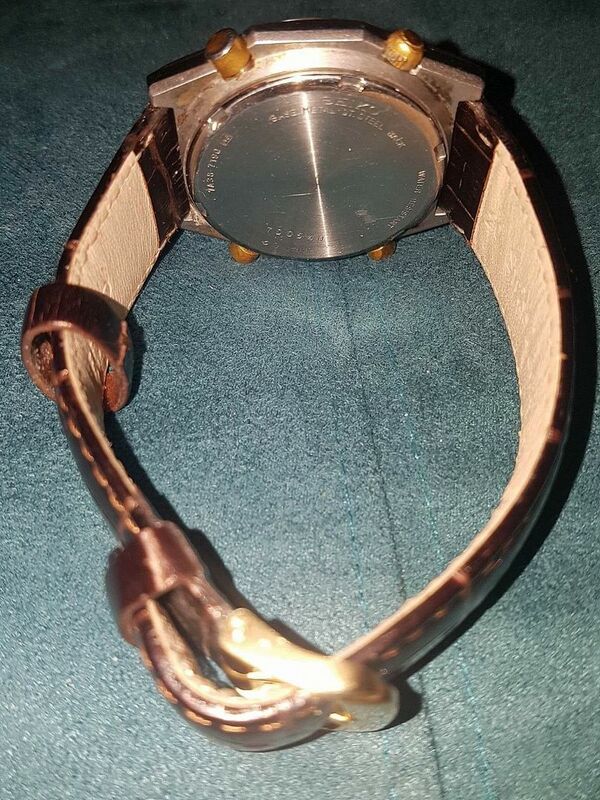 Has a brown leather band attached. The case is pretty obviously from a 7A38-7000. I'd suspect it was once a gold-tone, that has been stripped of its plating. 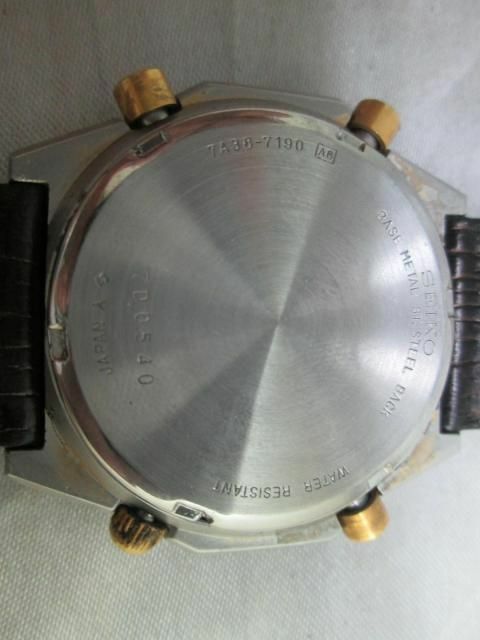 Likely the pushers and possibly the badly worn crown came from the same watch. 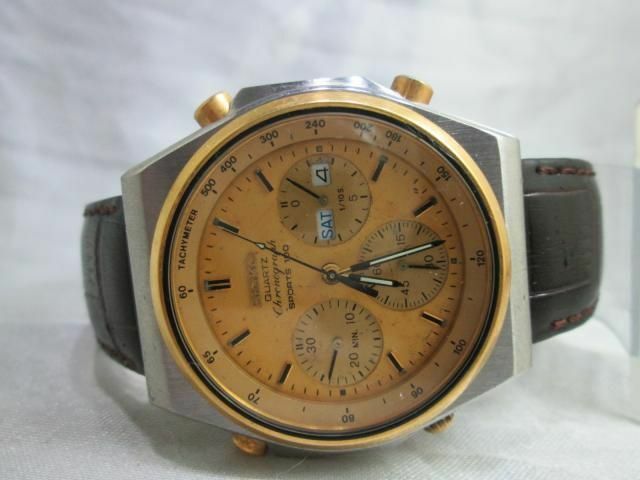 The Tachymeter ring is not from a gold-tone 7A38-7000. That would have radially printed numbers. If I'm not mistaken it's from a gold-tone 7A28-7029. 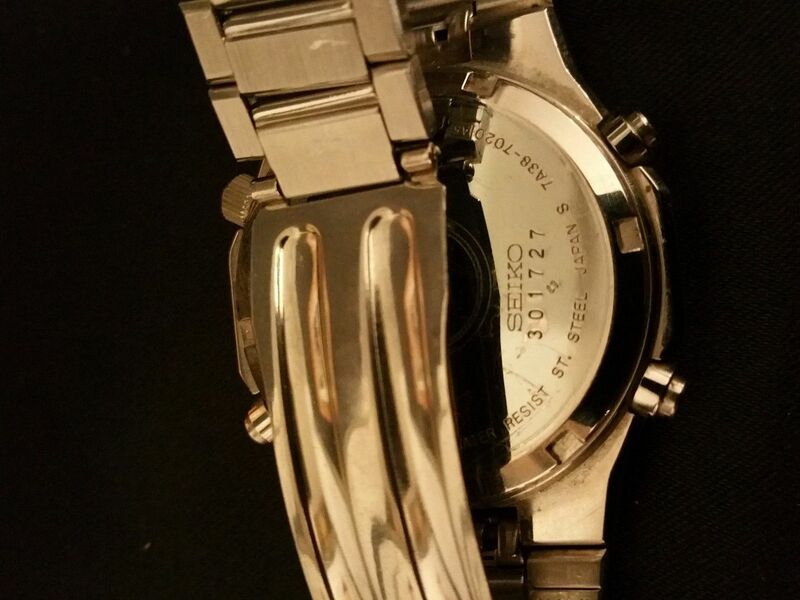 The bevel angle on the bezel doesn't look right for a 7A38-7000 and I'd suspect is also from a gold-tone 7A28-7029. 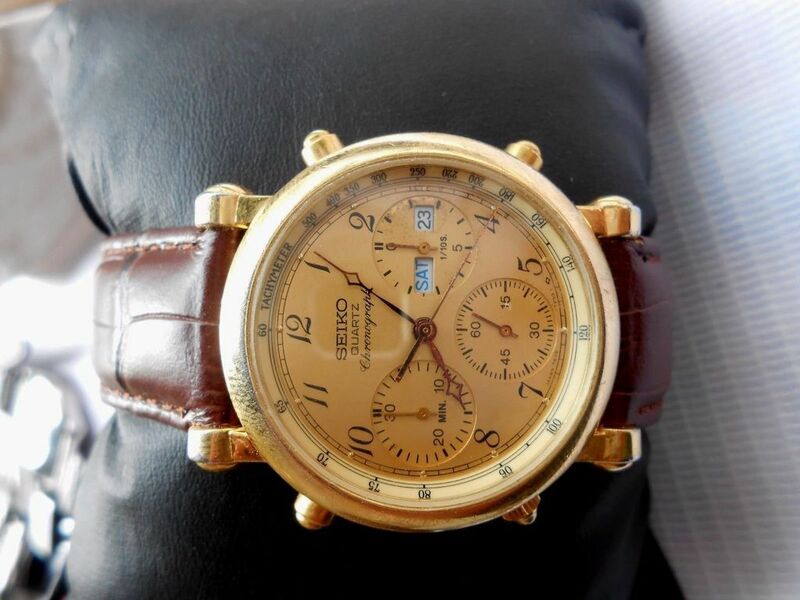 The gold 703L 'Sports 100' dial, hands (and presumably movement) are from a 7A38-702A (or H) and the case-back is off a gold-tone 7A38-7190 ! 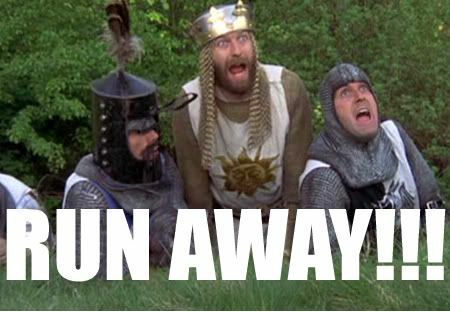 Hang on a minute .... as I was typing the above paragraph, it began to sound all too familiar. This is another case of Déjà Vu !! To save you searching back through this thread, as I've just done, here's a copy and paste of my posts from the bottom of page 2. (Or at least the relevant parts of them). It's been a while since I've seen anything quite this bad (or so blatant), but here's an absolute classic 'bitza' 7A38 Franken from the bench of Filipino arch watch botcher Badingski - a.k.a. Ramoncito Bangit. Would anybody else like to identify the component parts ? Hint - the case-back is off a gold-tone 7A38-7190 ! So nobody going to have a go at it ? It's dead easy really. 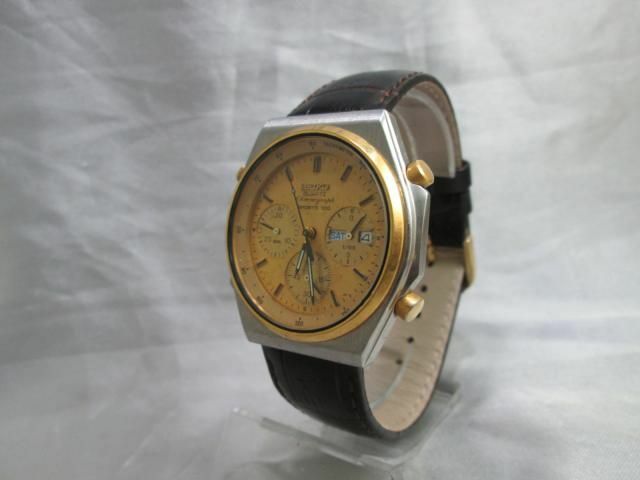 The case was once a gold-tone 7A38-7000. 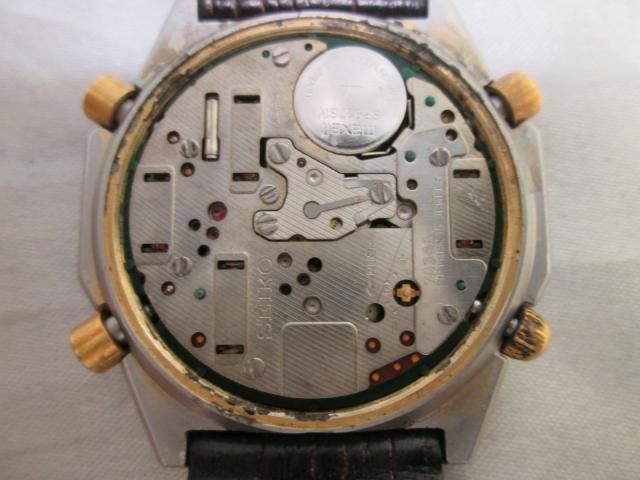 The main body of the watch case has been stripped of its gold plating, but perversely the bezel, pushers and crown have been replated (in Badingski's inimitable slapdash fashion). 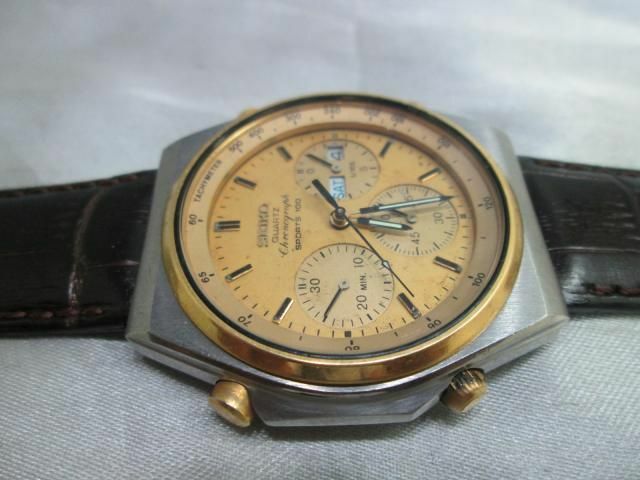 The Tachymeter ring appears to be from a 7A28-7029 and the Sports 100 703L dial is out of a 7A38-702A or H. All topped off with the case-back from a gold-tone 7A38-7190. What you've got to remember with botched-up 'mix and match' crap like this, is that it doesn't necessarily mean original to this watch. Caveat Emptor, as always. Gentlemen. 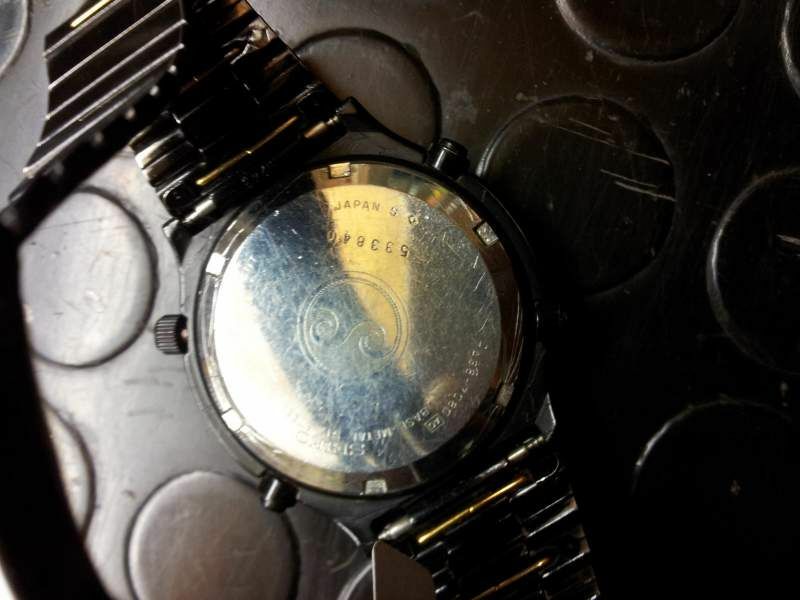 Clearly the same botched Franken watch currently listed by the Australian seller - the case-back serial number 7D0540 matches. 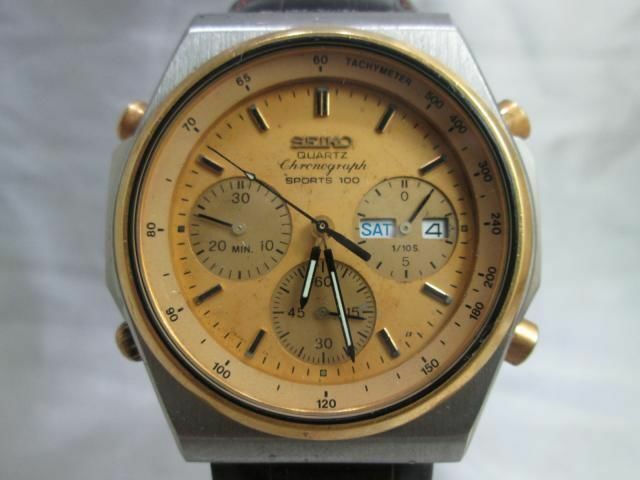 The only thing I'd previously failed to spot (or at least properly identify), first time around, was the re-plated 7A28-7029 bezel. Unfortunately, it seems I didn't record the selling price that Badingski's 2013 eBay auction for this horrible Franken achieved. 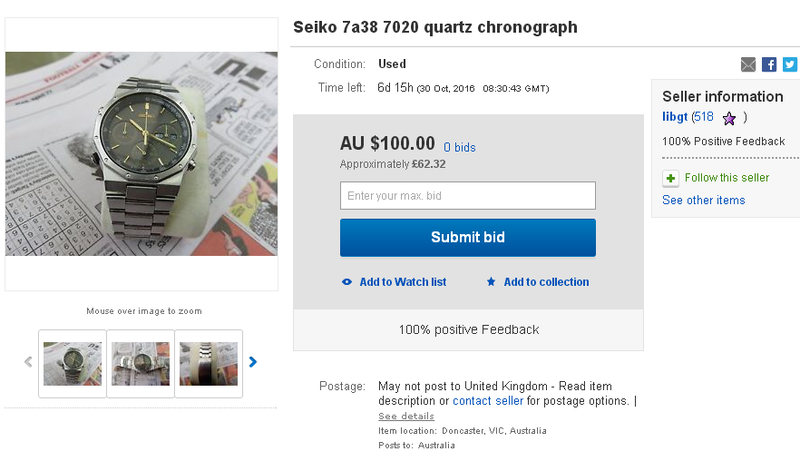 Is that the selling price was a LOT less than the current would-be Australian seller's 'pie-in-the-sky' Buy-it-Now of $350 Au !! 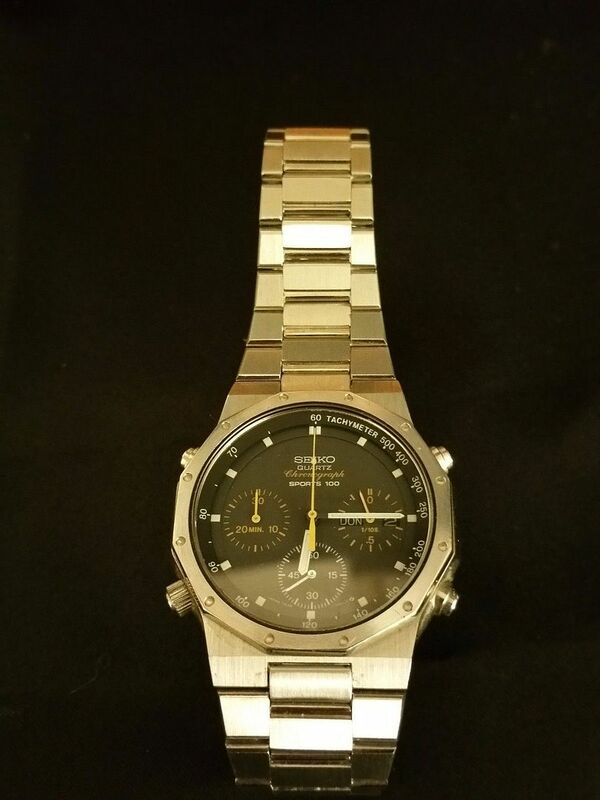 You know, Paul, $350 is an absolute steal when you consider how many watches it took to make this one. I'd forgotten to post the result for that Yahoo Japan auction last week. 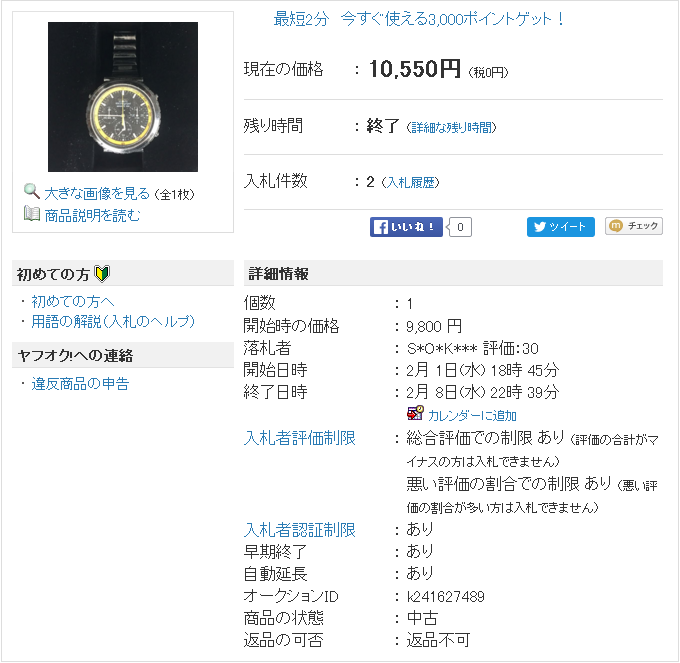 It sold for ¥10550 Yen (equivalent to approx. 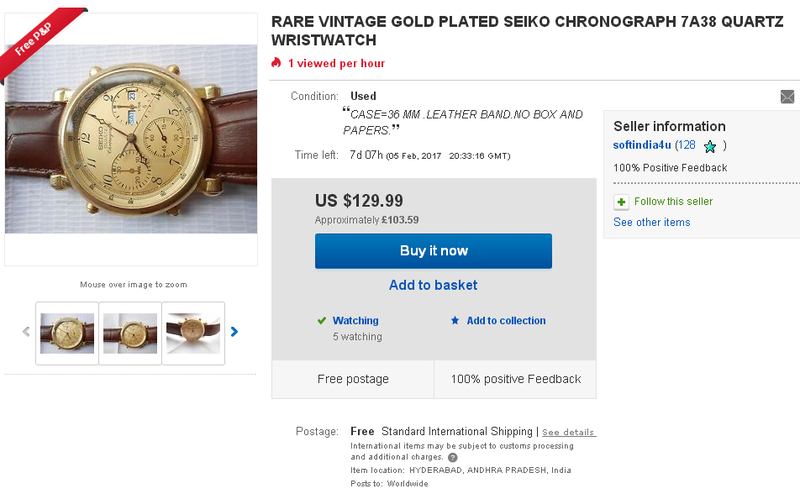 $92.20 USD / £74.25 GBP) after only 2 bids - a LOT less than either of the original donor watches might have fetched - even in poor condition. Here's another fairly awful Franken listed by a German eBay seller. 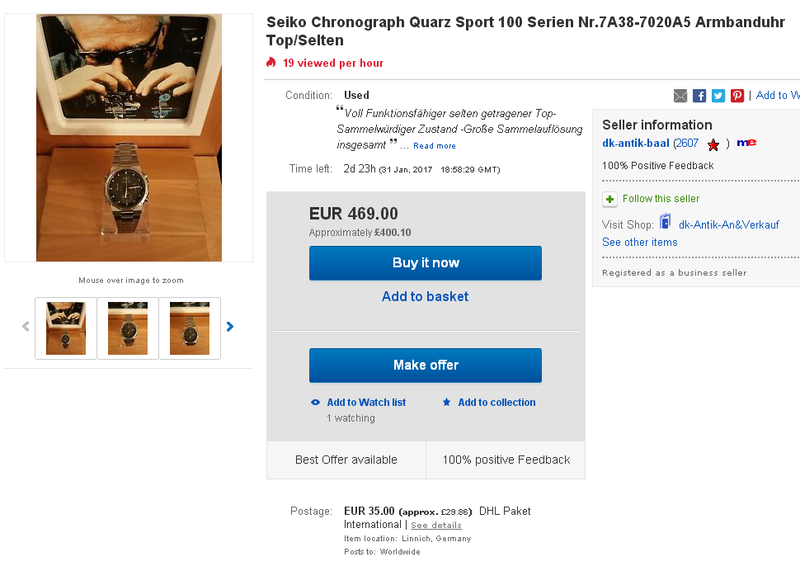 Once again, there's no mention of any model number in the listing title or description - just 'Sports 100' - nor any claims made for the watch's originality. 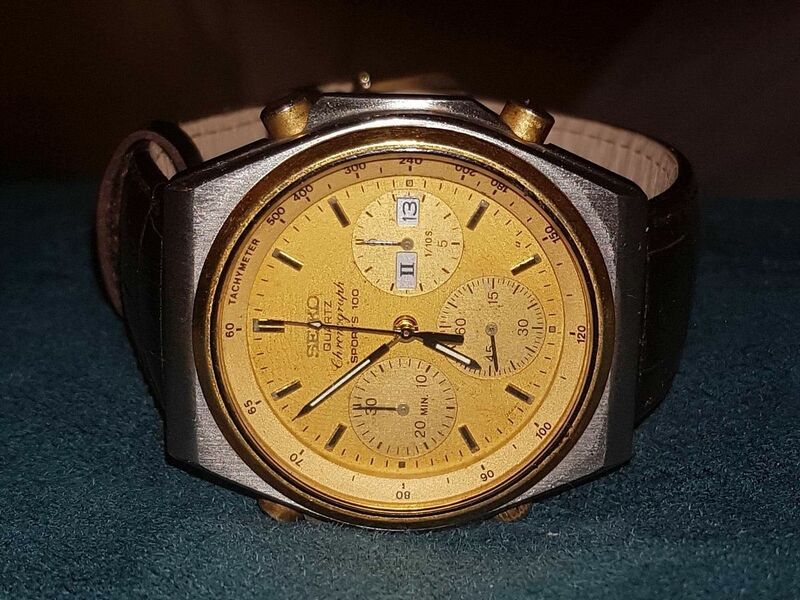 This one's quite easy to analyse - the watch case is from a well-worn two-tone 7A38-7060 and the taupe coloured 703L dial, hands and presumably movement are from a stainless 7A38-7020. 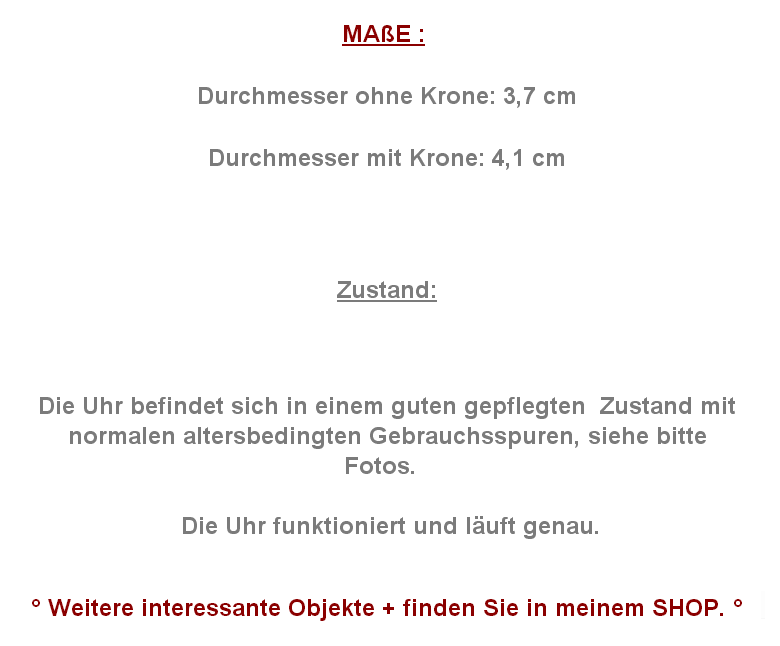 Both models appear (in their standard unmolested forms) regularly on eBay Germany. 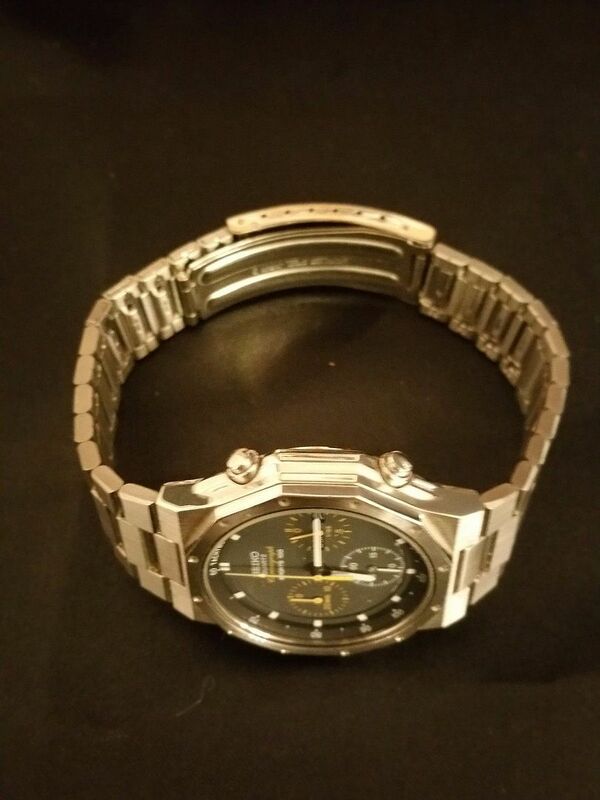 The stainless bracelet fitted is a 'generic' aftermarket item. I've only bothered uploading 7 of the seller's 12 photos, because a few are quite similar. Hopefully the 'pie-in-the-sky' Buy-it-Now price of 295 Euros and scabby hands should deter most punters. The above 7A38 Franken, listed on eBay Germany appears to have sold very quicky, later the same day - quite incredibly, for the full 295 Euros asking price too, as far as I can tell. And they say there's one born every minute. Makes me wonder why I bother, sometimes. Here's 'a blast from the past'. 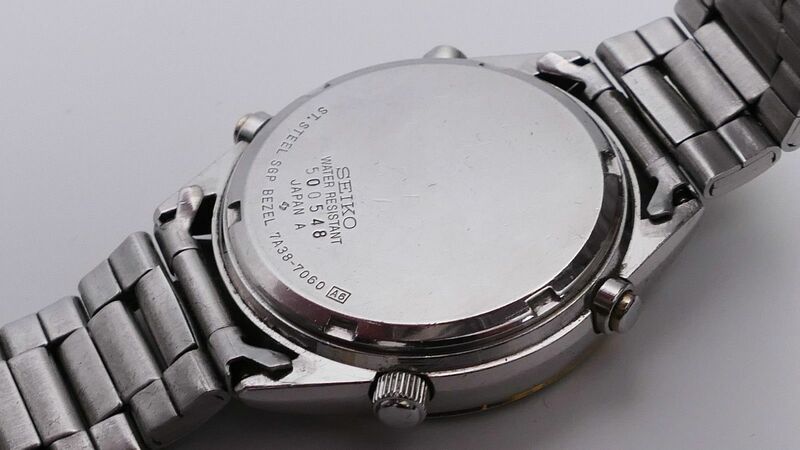 Remember that 7A38-7080 fitted with the dial / hands / movement from a 7A38-7180 and a non-original replacement Seiko bracelet, that first appeared on eBay Italy back in January 2012 ? If not, I wrote about it near the top of the first page of this thread. (I'm pretty sure it made a second appearance, but I can't be bothered to page through the thread to find it, at the moment)*. 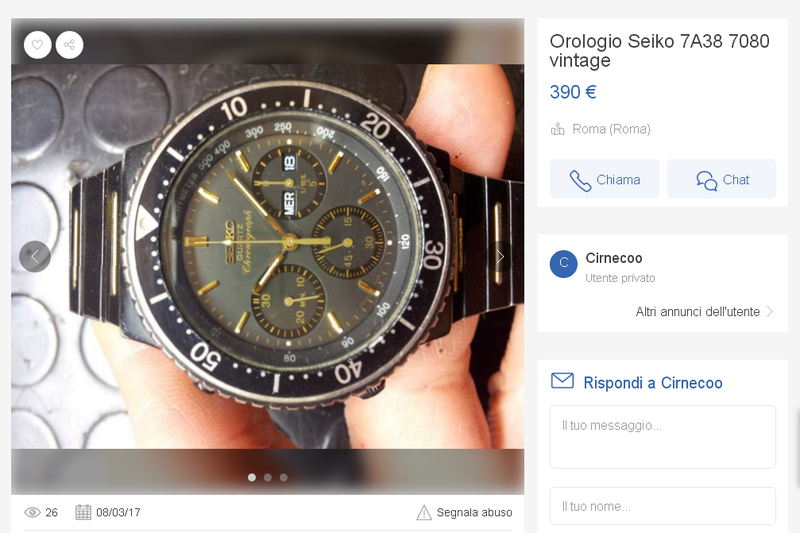 Well it's just reared it's ugly head again - on the Italian free classifieds site Kijiji.it. *That black dimpled vinyl flooring used as a backround looked familiar, so I did make the effort to page pack through the thread. 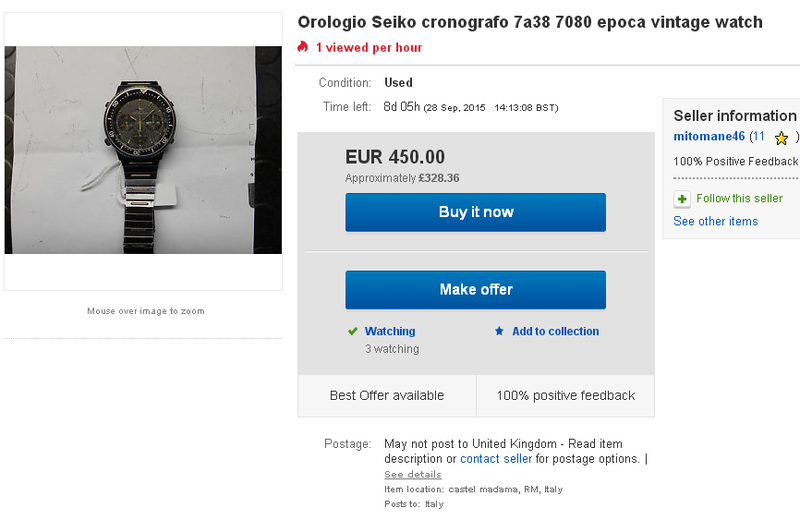 Sure enough it's just visible either side of the grubby piece of paper in the most recent Italian eBay seller's listing photo (2015). I had to smile to myself earlier this week. 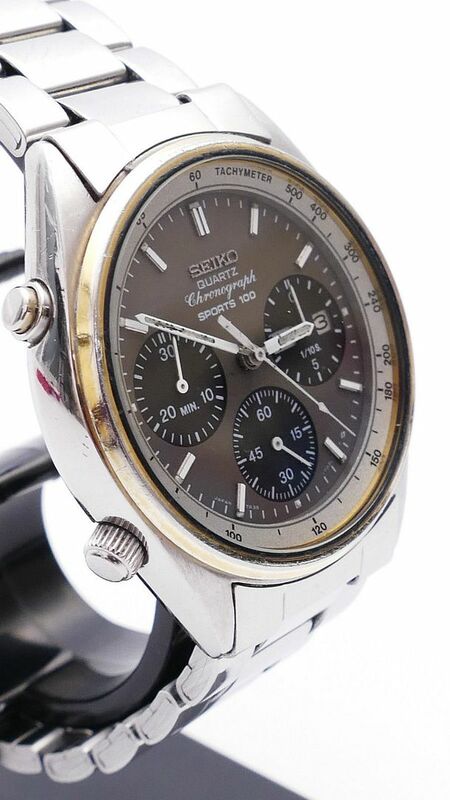 That Franken 7A38-7080 from 3½ years ago has re-surfaced again on eBay Italy. 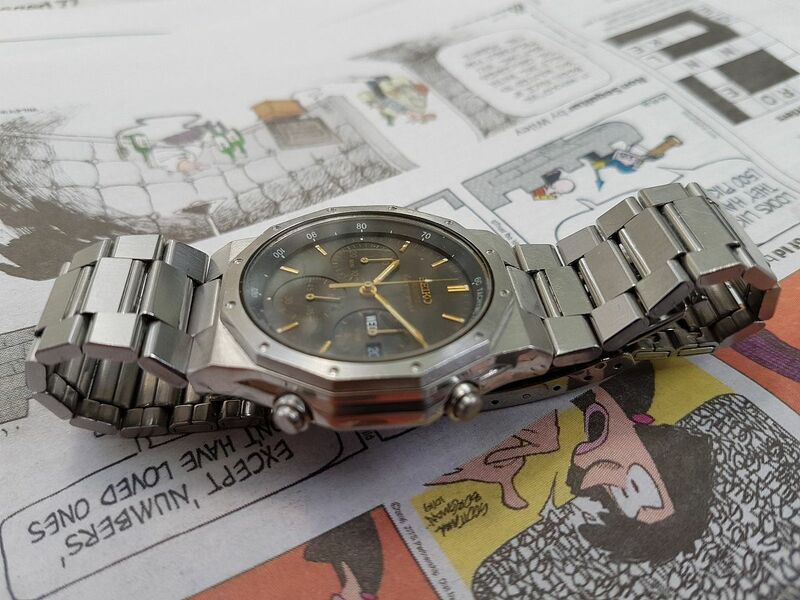 It's clearly the same watch, still fitted with the black-ish 710L dial from a 7A38-7180 and the same ill-matched bracelet as discussed on the first page. The addition of a paper hang won't fool anybody - and the preposterous Buy-it-Now asking price of 450 Euros should hopefully be enough to deter the most unwitting potential buyer. Please excuse the double 'Quote and Reply'. Clearly still the same Franken watch - and floor covering. 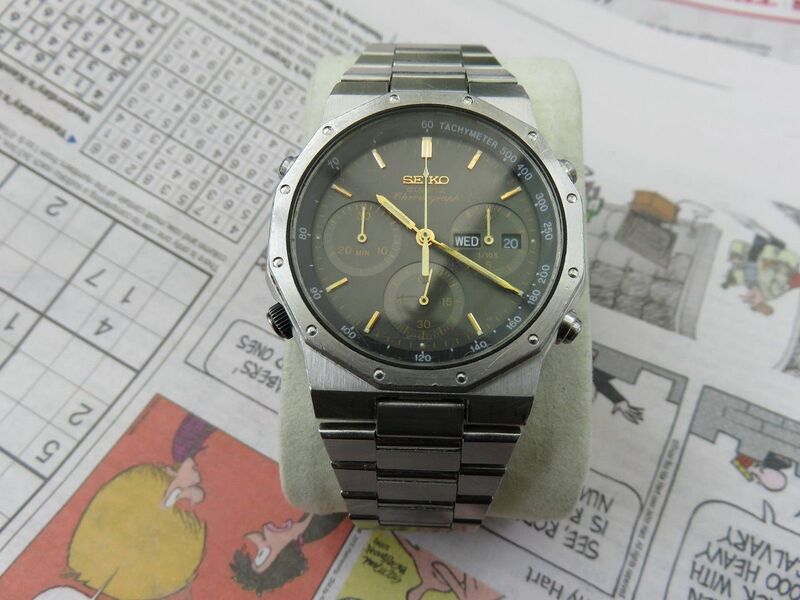 Checking my eBay watching page, I noticed that horrible Yema N8 cased 7A38 Franken finally sold yesterday - after 4½ months. All it ever takes is one 'mug punter' to hit the Buy-it-Now button.